Antique bisque porcelain dolls were manufactured in the mid-1800's through the early 1930's. Their popularity came from the realistic resemblance the bisque porcelain bore to human skin. The cool, smooth skin along with the artistic painting gave the dolls a very realistic look that still attracts doll lovers today. 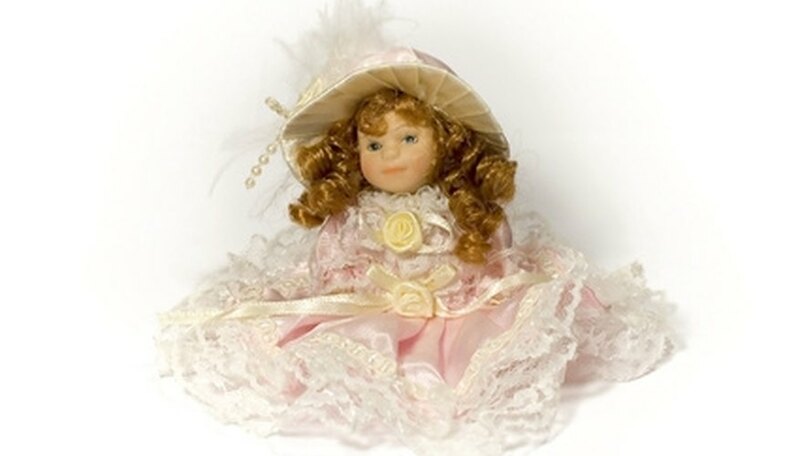 Reproduction bisque dolls gained popularity in the 1970's as the price of the antique dolls climbed. Some reproduction dolls made by talented artists have become collectible in their own right. Knowing the difference between an authentic antique doll and an excellent reproduction can save time and money. Examine the entire doll since it is not unusual for antique doll parts, such as heads or bodies, to be combined with reproduction parts to create a new doll. Look at the quality of the bisque porcelain used to make the doll head, hands and legs/feet. Porcelain has fine tiny "pores" that may have collected some dirt if the doll is old. Check behind the ears, between the digits of the hands and feet. The cheeks, hands or feet may show wear in an antique doll. Familiarize yourself with the names and marks used by the manufacturers of antique dolls. Check the back of the neck of the bisque doll head for a mold or manufacturer's mark. Be aware that some antique doll heads bear no marks at all and some reproduction dolls have similar mold marks on the back of their necks. You need to explore further to determine an antique doll from a reproduction. Examine the entire head, inside and out, if possible. If this is an antique doll with a wig and glass eyes, there should be a small opening at the top of the head. Gently remove the wig which is glued to a small cardboard or cork circle called a "pate" which covers the hole. Lift the wig and pate starting from the back so as not to stretch or rip the wig. Check the inside of the head for any "clean" looking plaster that may indicate newly-repaired cracks or work done on the glass eyes. Look inside the head for dirt that may have collected over the years, especially near the eye openings. Examine the face of the doll and the way in which it was painted. Antique dolls have carefully painted features with delicately feathered eyebrows, lightly blushed cheeks and natural looking lips. There should be no fingernail polish on the finger or toenails. Ears on some of the antique fashion dolls and some French toddler-type dolls were pierced so that the doll could wear "ear bobs" or earrings. Unfortunately, many talented reproduction artists can duplicate the face of an antique doll. Examine the body of the doll. Many older dolls had kidskin or leather bodies which will be discolored and stiff with age. Check the stuffing as the antique dolls were stuffed with sawdust of horse hair. Reproduction dolls usually have cotton bodies stuffed with polyester fiberfill and are often more loosely stuffed than the old ones. Some antique dolls had linen or cotton cloth bodies too but the fabric will appear old and usually stuffed very tightly in order to support the weight of the bisque head. Check the doll body carefully if the head of the doll is mounted on a composition, jointed body. Composition is made of sawdust and glue and poured into molds to make doll parts and then painted. Old composition bodies will probably bear some signs of play as well as damage from heat and cold. Look for crazing in the painted finish as well as cracks and chips. Check for repairs to the hands as many composition hands have lost a finger or two. Cheaply manufactured reproduction dolls will not have composition bodies because of the work and cost involved. A good collector learns everything she can about the item she collects. Visit your local library and read about the antique bisque dolls. Pay attention to the details of the face, hands and marks of these dolls. Visit your local historical society and view the collection of dolls. Seeing these dolls in person will give you an idea of how these beautiful dolls really look. Go to a doll collectors fair or sale. Talk with other collectors and ask questions. Most doll collectors are willing to share information along with stories of how they put their collections together. If possible, pick up and handle some antique dolls. Feel the way the bodies are stuffed. Look at the back of the necks. Check out all kinds of reproduction bisque dolls from the very inexpensive to the highly collectible ones. Identify what sets them apart. Compare them to the antique dolls that you have seen. Develop a relationship with a doll seller that you trust. This may not be easy at first. Do your homework and ask around. Find someone who can help identify reproductions and guide you in your first purchase. Never rely on the way the doll is dressed or the appearance of the wig. Many beautiful antique French bisque dolls had their lovely curls cut and "bobbed" by loving little mothers in the 1920's when that was the hairstyle. If you plan on purchasing a very expensive doll, get a receipt from the seller that states you have at least 48 hours to have the doll authenticated by a doll expert or else you can return the doll for a full return of your money. Antique Dolls: What is my doll made out of?